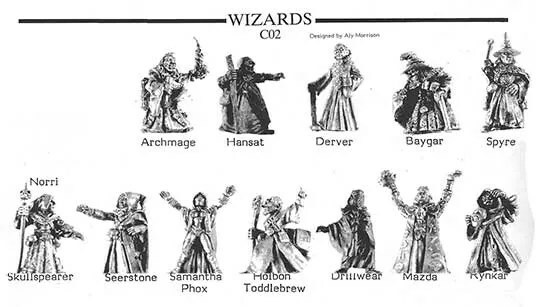 Sorting through my wizards I found I had nearly all of the C02 wizards from the 3rd Citadel Compendium. 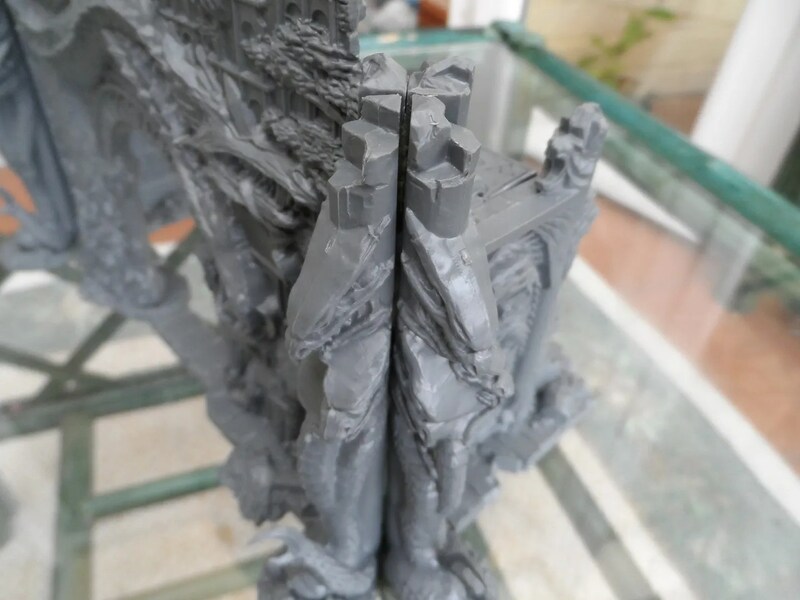 So naturally I spent time on e-bay to find the missing couple. I quickly chased down a couple of them, and then spent a month before I found “Derver” which I’d never seen before, and suddenly I found loads of them. Drilwear was tricky, but it wasn’t long before I got an inexpensive copy. 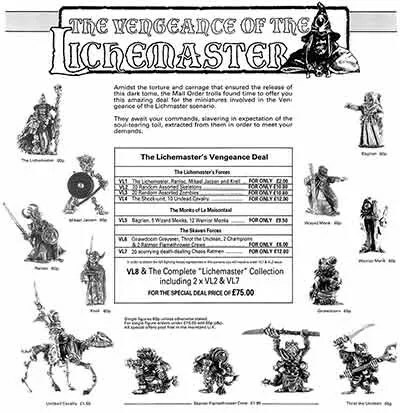 That left Hansat,I thought it should be quite common as it was used in the Vengeance of the Lichemaster in the Spring 1986 Journal scenario. 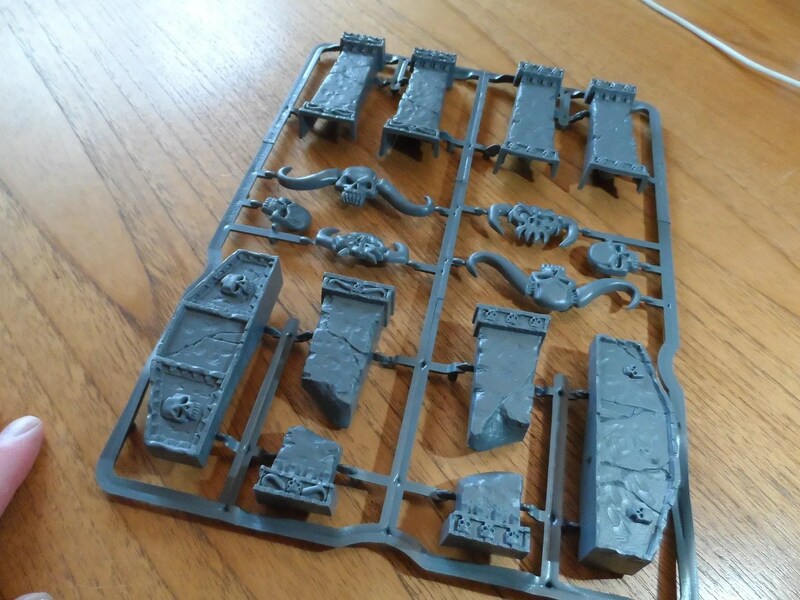 After 6 months nearly I finally tracked a copy down and now have the full set…in varying states of paint abuse ! 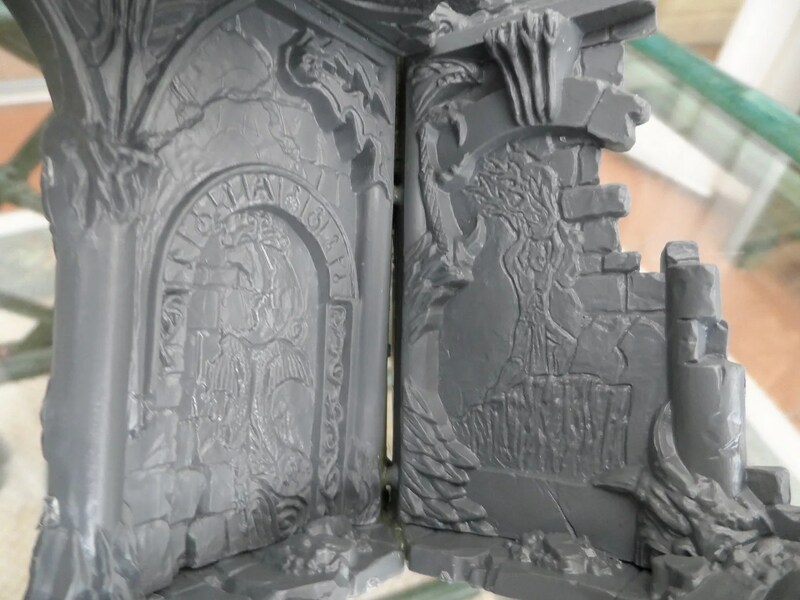 The entire set is quite large, as can be seen by the depth of the box (28mm frost grave figure for scale). 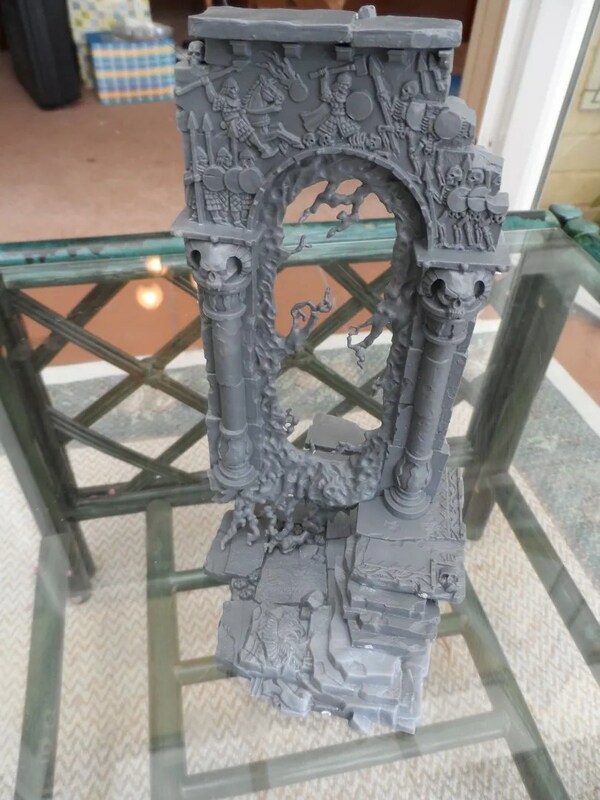 These have the ruined upright columns on, plus the decorations of various skulls, skulls with horns, and demonic faces. 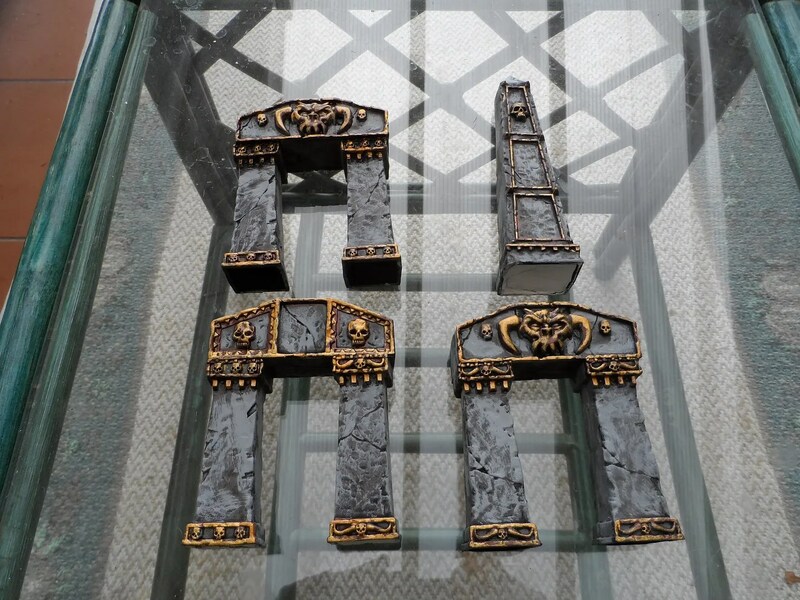 One set is not enough to turn these decorations into useful gaming markers, but two sets might just be enough – skull makers for those wavering units for example. 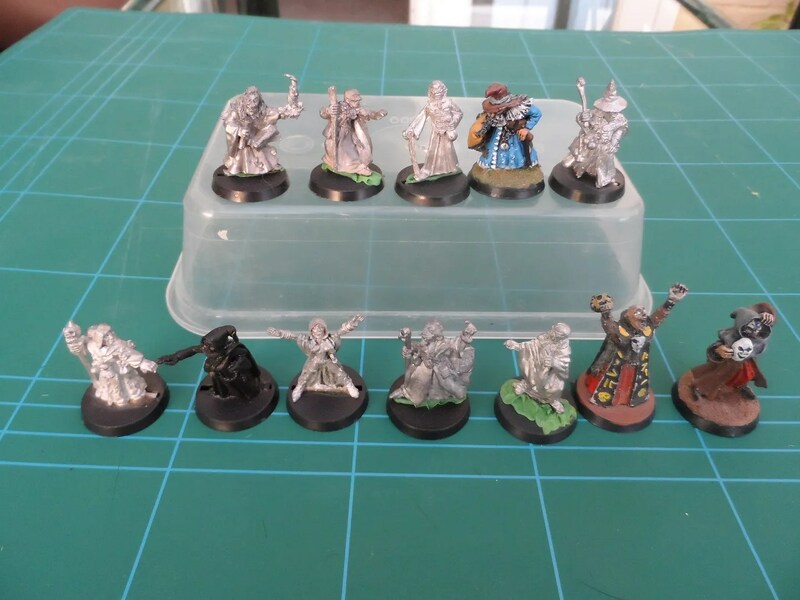 Next ups should be some actual figures I’ve painted. 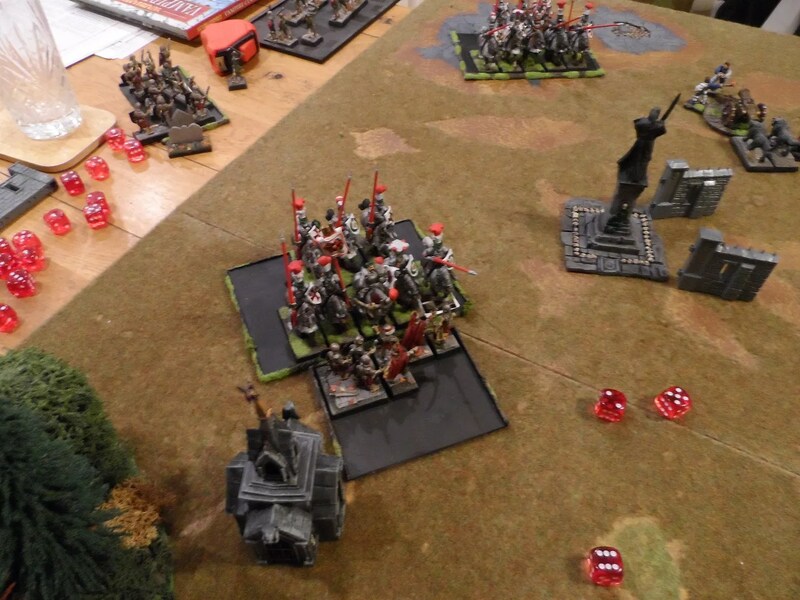 So the Savage Orcs that had broken through on my flank, did the decent thing and piled in to the Silver Talon spears. 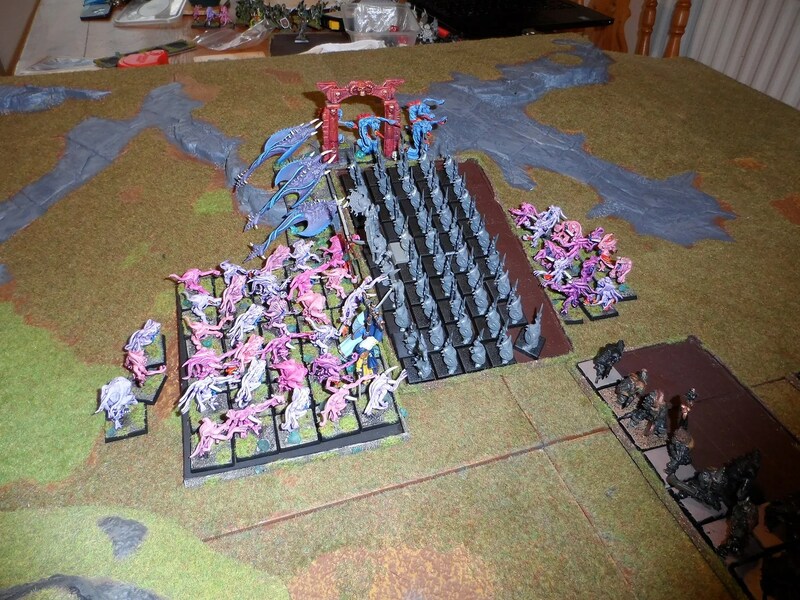 Or rather, some of them piled into combat, as more florid friends the pink flamers zapped them beforehand. 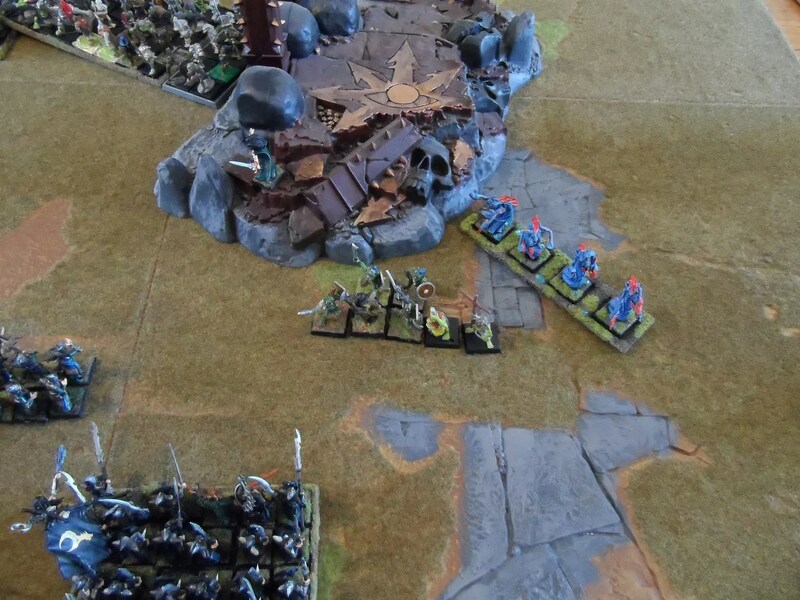 Both sides got stuck, as I slowly ground down the Savage Orcs for the next two turns. 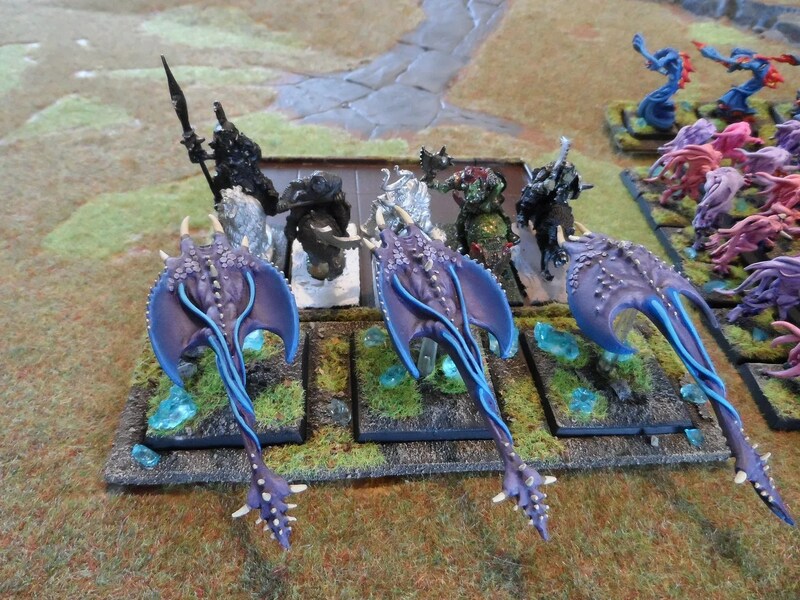 Nav gave Richard pause for thought as the Goblin Wolf Riders piled in to the blue Screamers. 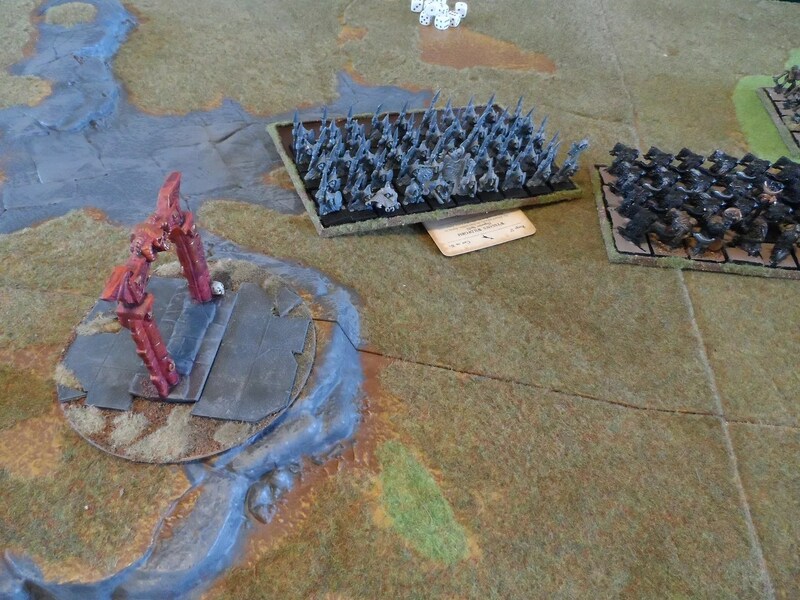 The screamers defeated them in combat but failed to catch them on the follow up. 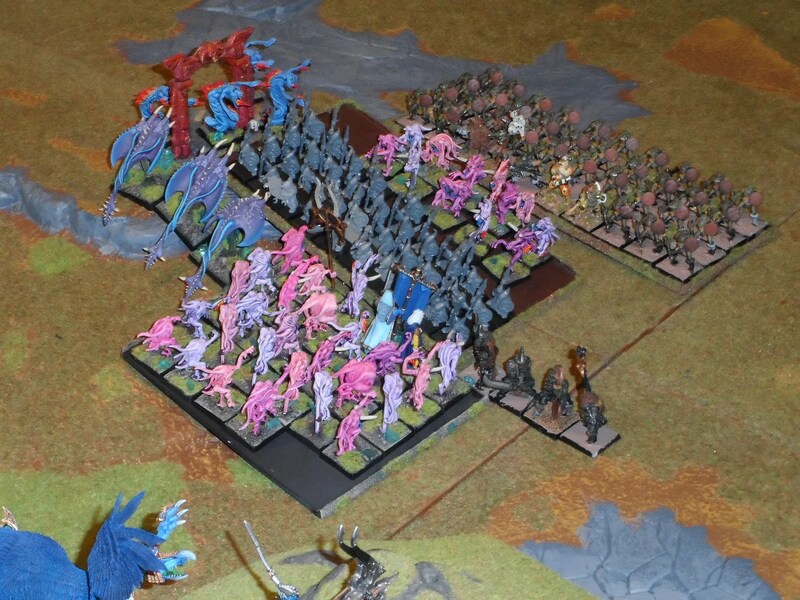 The winds of magic were with us, and as a result, another unit of Pink Horrors turned up. 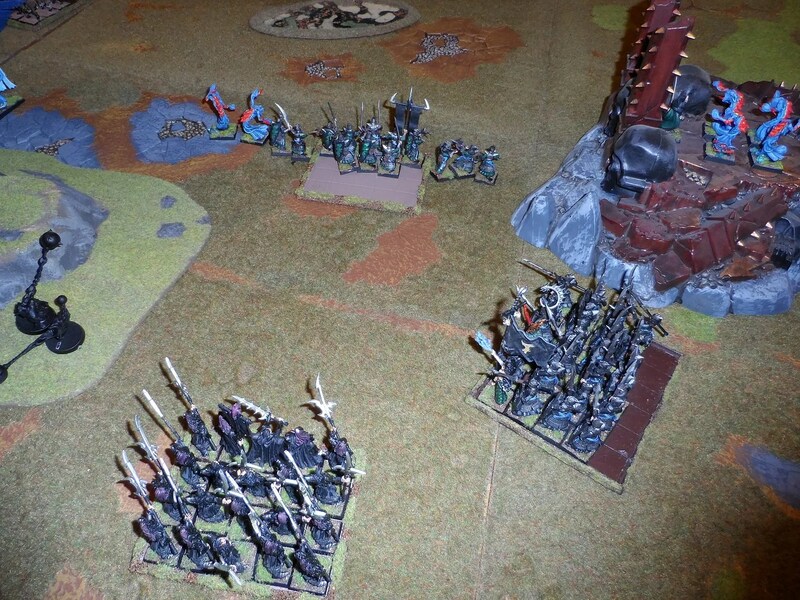 So Richard slapped them down behind the enemy lines in preparation for making greenskin sandwiches. 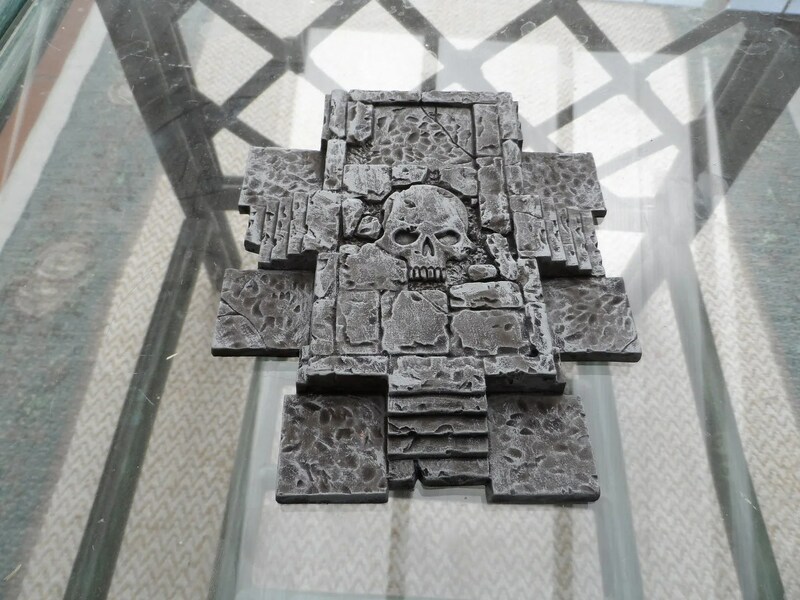 A bit like this. 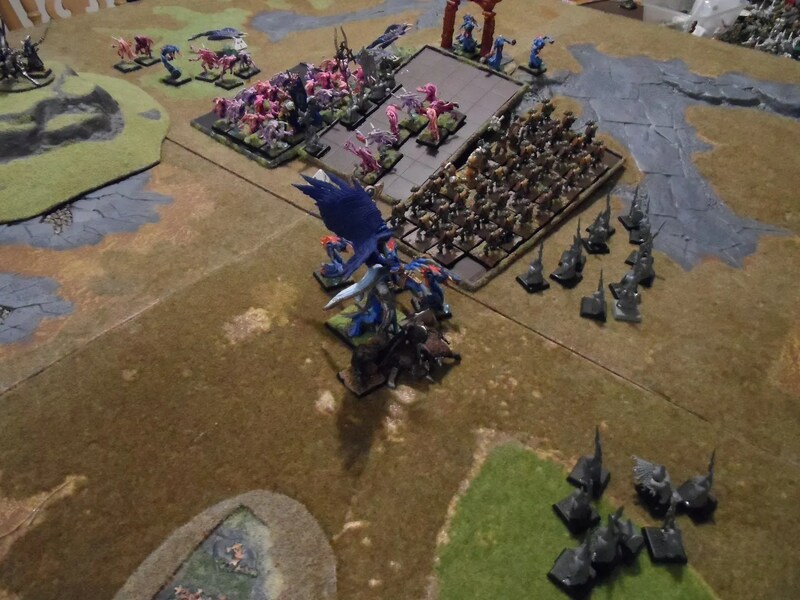 The goblins had failed their charge due to animosity, so the Pink Horrors and flamers were sent in from all sides after the wolf riders had been finished off. 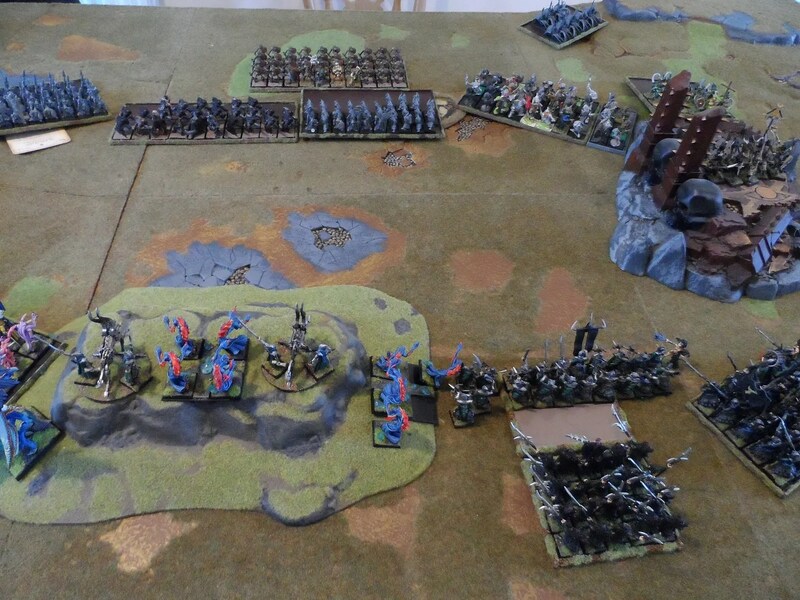 Back on my flank, a combination of magic, flamers and RXBs whittled down the main Orc Fyrd unit. 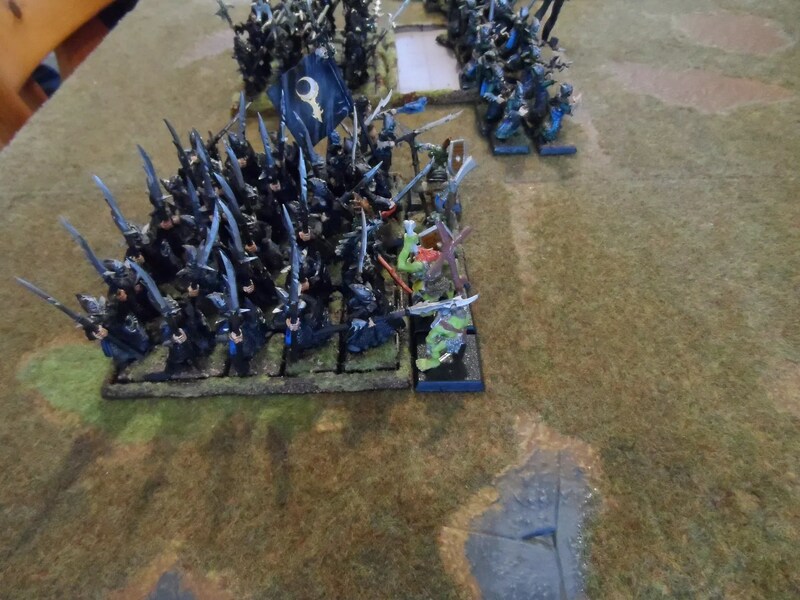 The large goblin archer unit meanwhile lost casualties moving through the bog and did precious little damage on the shooting phase. 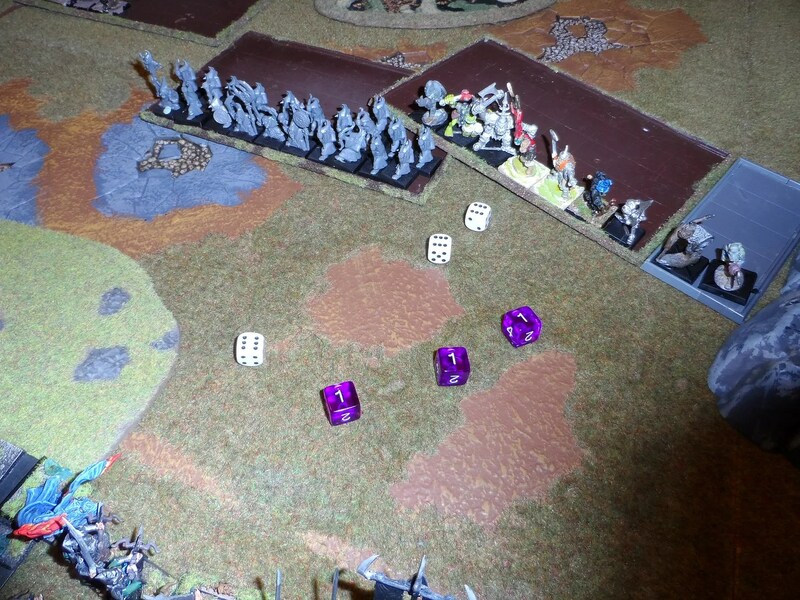 Despite the best efforts of my dice rolling (Fav’s are the small white dice [size isn’t everything], mine are the large purple dice). 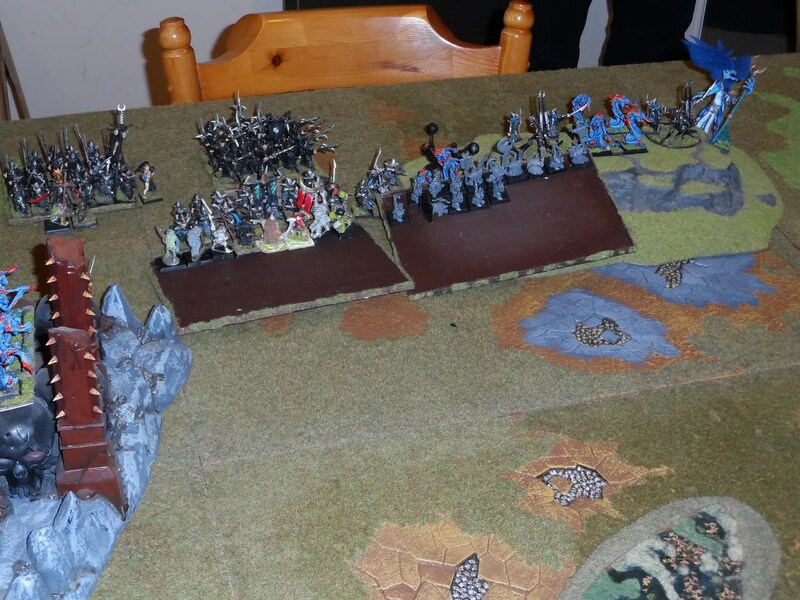 the huge goblin horde was being whittled down, and more gradually and in a non dramatic way so were Eeza Ugezod’s Black orcs who were pummelled almost into oblivion with magic, flamers and RBTs for three rounds. 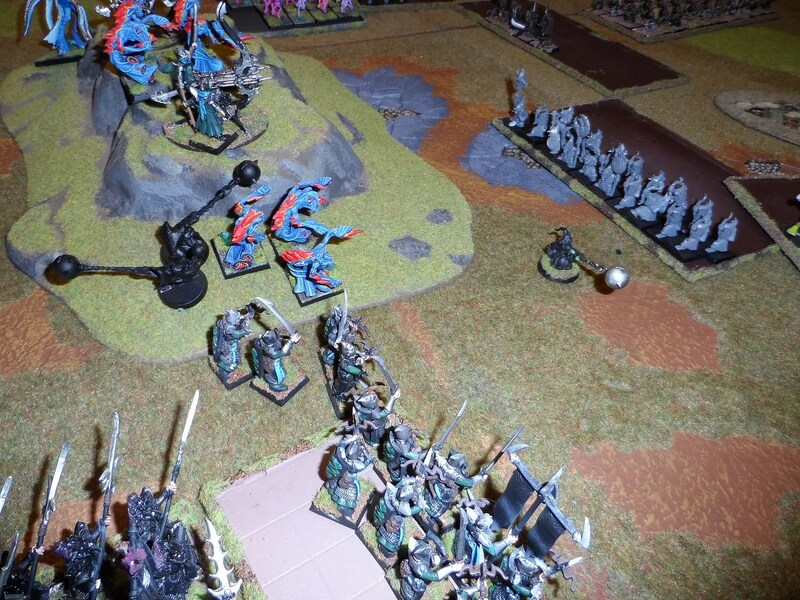 The charging goblin archers released some fanatics, fortunately with little damage to the flamers or RXBs. 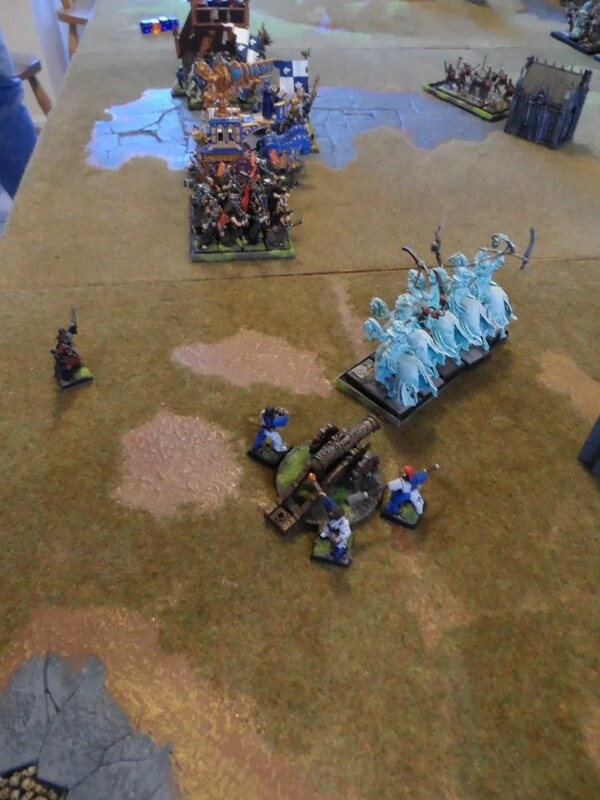 But this was followed by the crunch moment when both the remaining Orc Fyrd and goblin archers closed in for combat with the DE RXBs, the flamers and RBT crew. 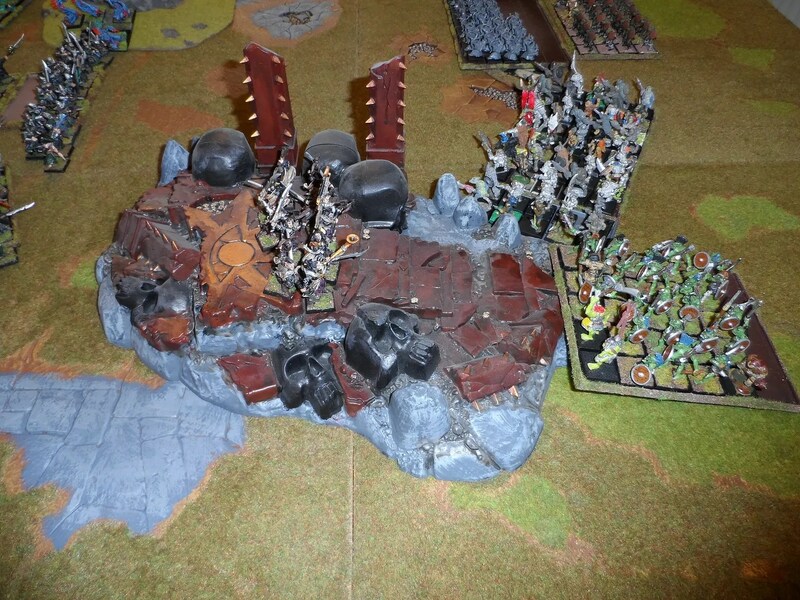 At the same time, Nav charged Harboth’s Black Mountain boys into the main melee, along with EEza Ugezod’s remnants. Nigel Powers: Do you know who I am? Nigel Powers: Have you got any idea how many anonymous henchmen I’ve killed over the years? Nigel Powers: I mean, look at you. You don’t even have a name tag. 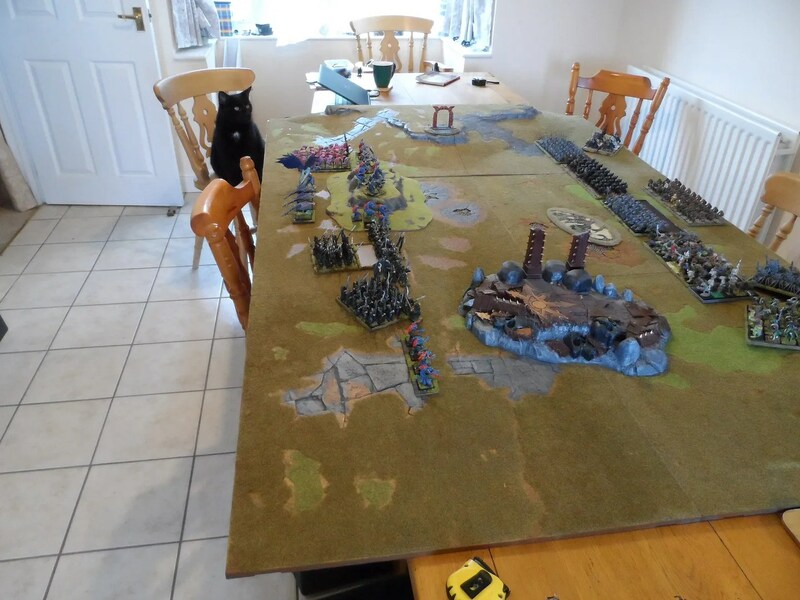 You’ve got no chance. Why don’t you just fall down? 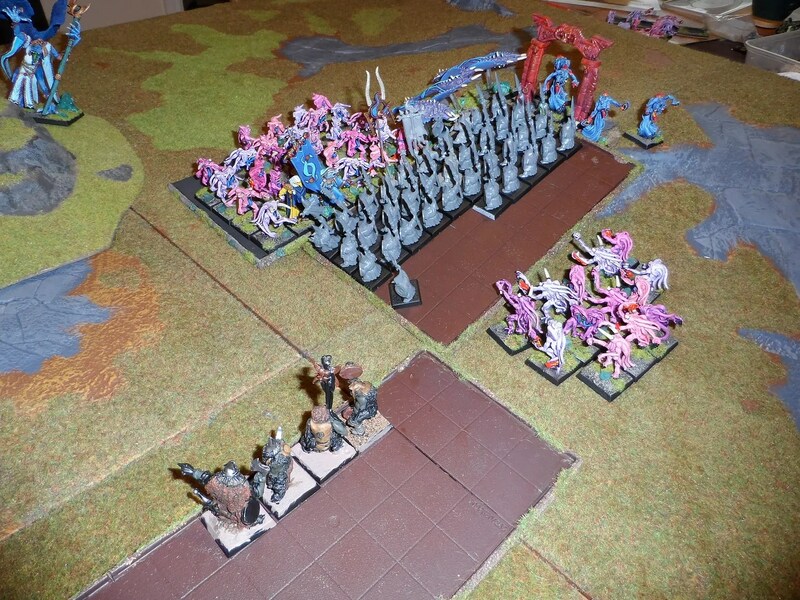 As this was pretty much the end of the battle, the Lord of Change waded into combat (apparently it was a magic user combo). 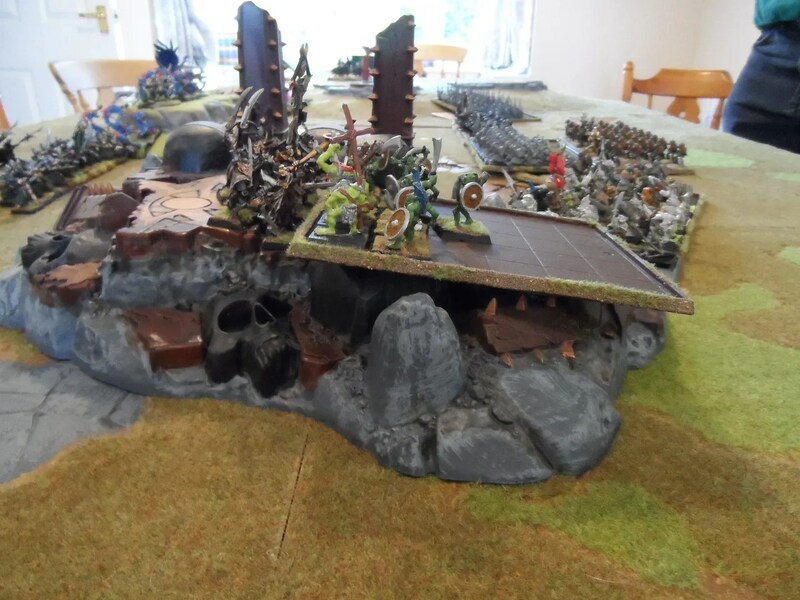 To everyone’s surprise, including mine, the combination of flamers, RBT crew and RXBs defeated the Orcs and goblins, and ran them down, crushing Fav’s flank entirely. 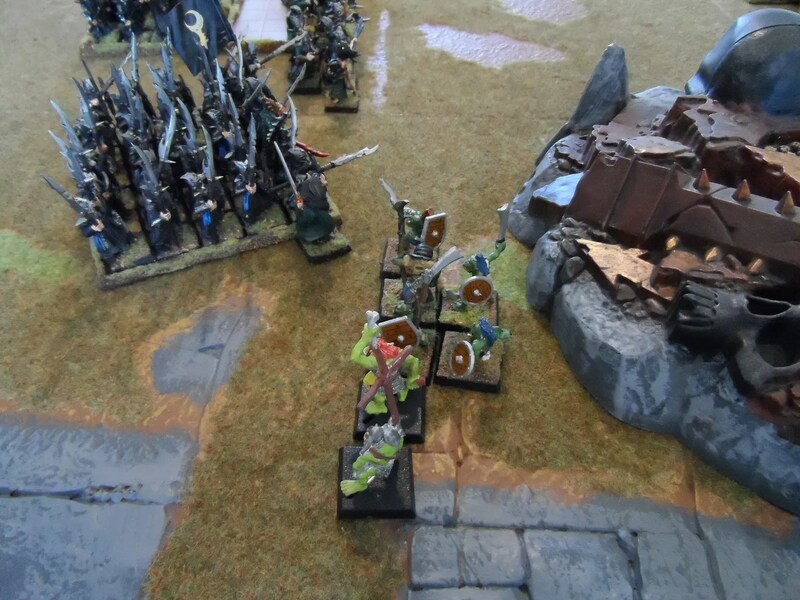 ironically, this left my Black Guard twiddling their thumbs all battle,, the Silver Talons had by now defeated the last Sacvage Orc and were similarly left hanging with nothing to do. 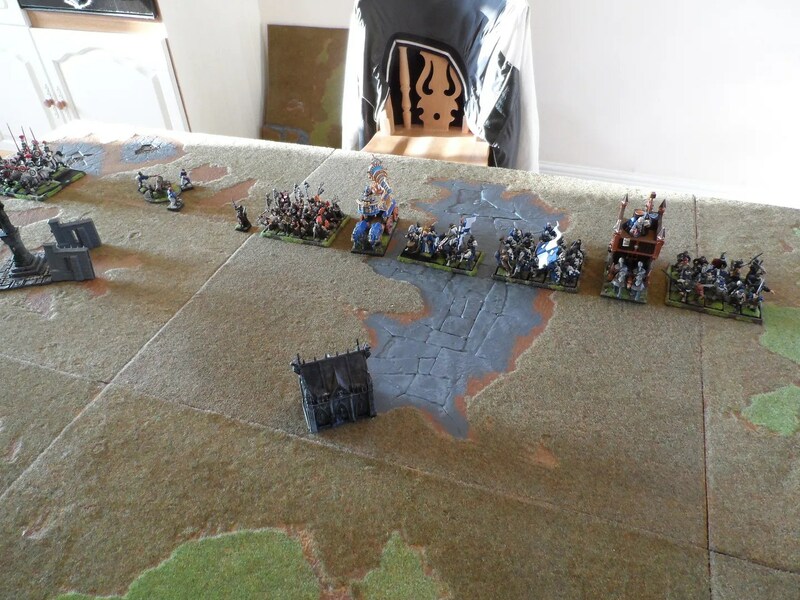 To finish off the job, the Lord of Change defeated and charged down Eeza Ugezod’s Black Orcs, just as the goblins were wiped out and the flamers moved in to crush Harboth’s lot. 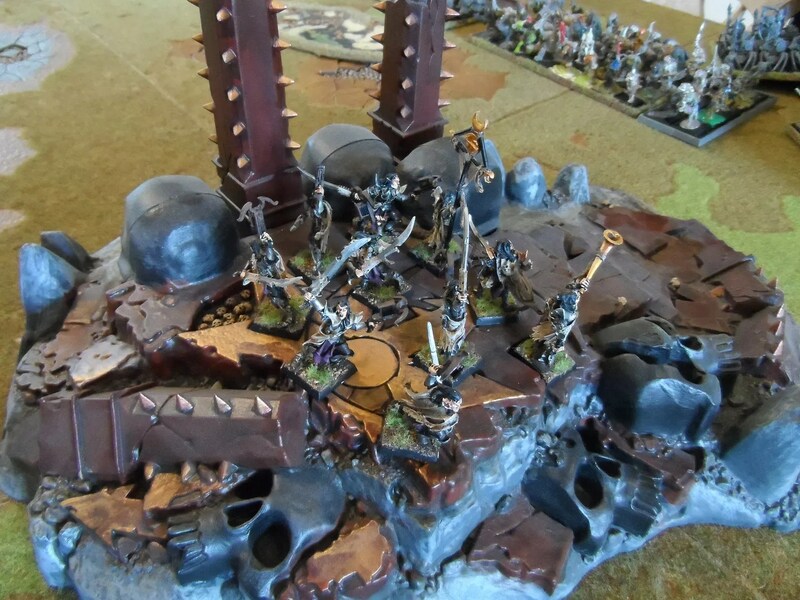 Victory went to the very strained alliance of dark Elves and Tzeentch. 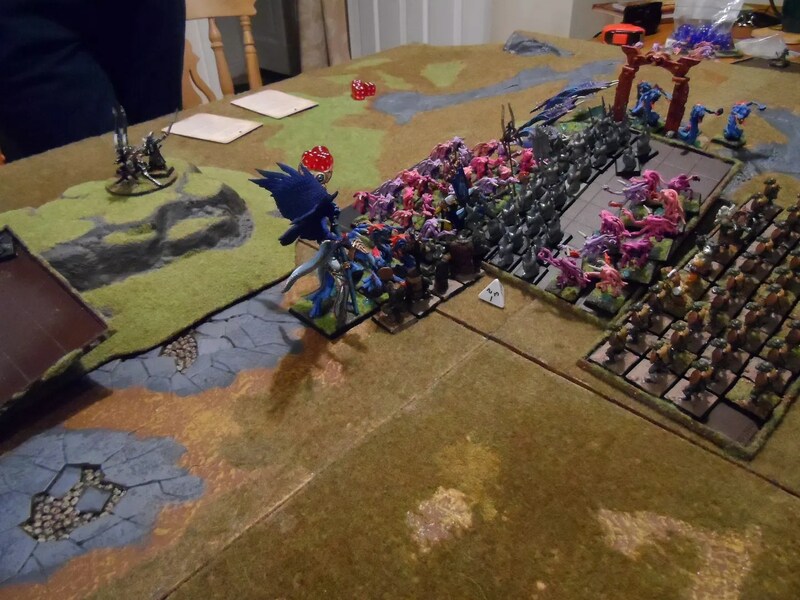 Most importantly, a good time was had by all, with many terrible dice throws, surprising combat results and so on. 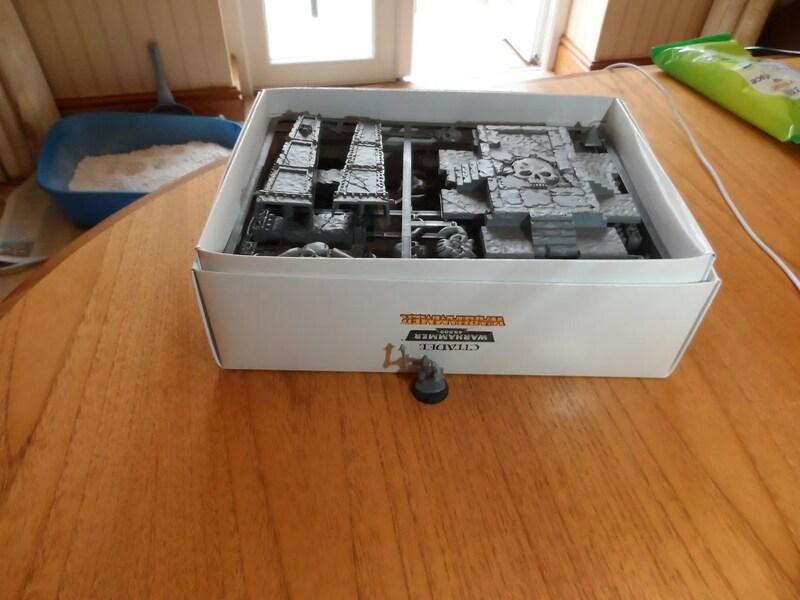 So, with my move date now firming up, I organised a Last Hurrah battle of WHFB, as I planned for my WHFB boards and figures to go into store as I would not have room for them in my new abode. Byakhees Gav and Rich were eager to play, the rest of the herd were busy elsewhere with inconsequential rubbish like rehearsing for plays etc. 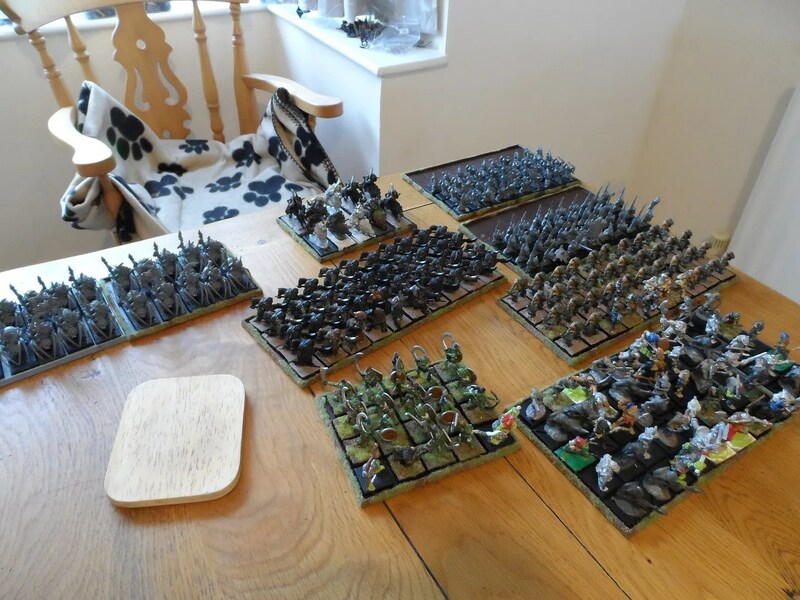 Nav came round and broke his army out of their comfy boxes the evening before to save time on the day – it took nearly and hour and a half as his is a horde army of Orcs & Goblins. We had originally hoped to have a two day session, but schedules were tight and I needed time for packing. 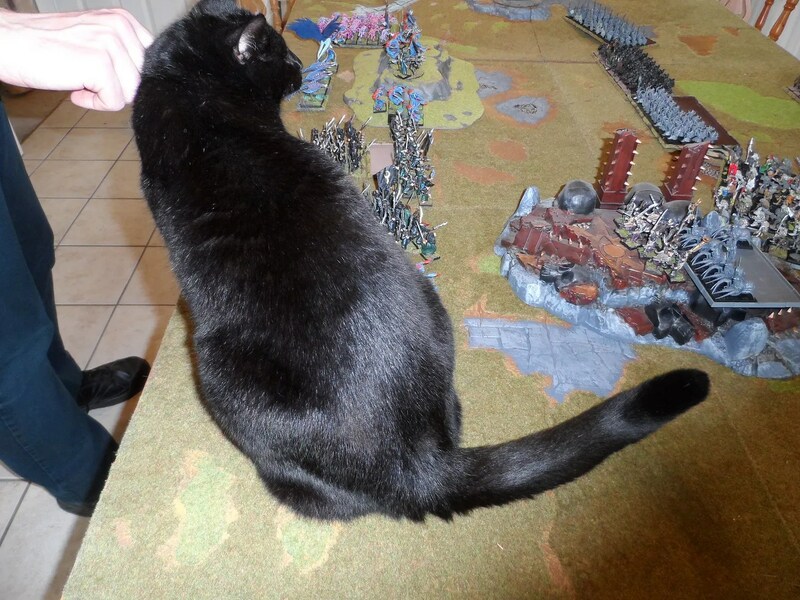 Gav didn’t get all his figures out so I didn’t know the full extent of what was going on, and he turned up with his laptop with the full army list, so BlackJack tried to get a sneak peak of it – he is after all a NINJA PUMA. 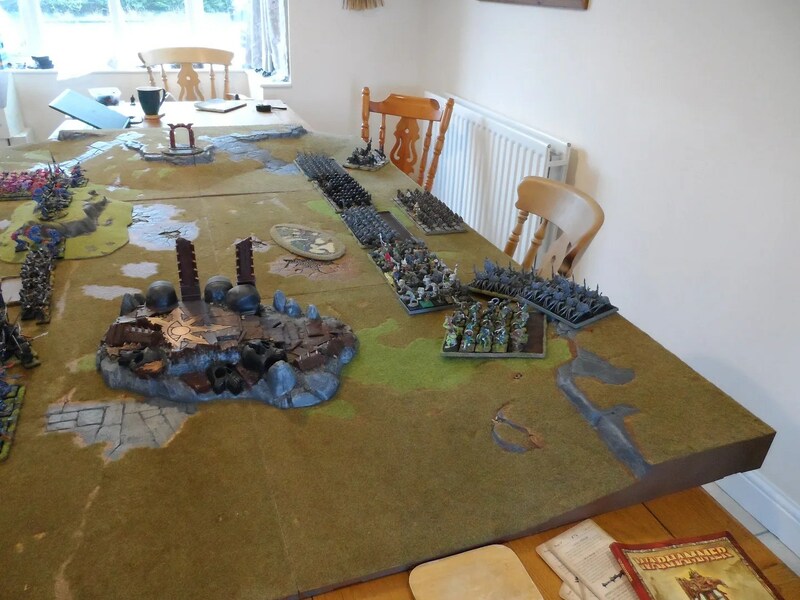 The armies set up. 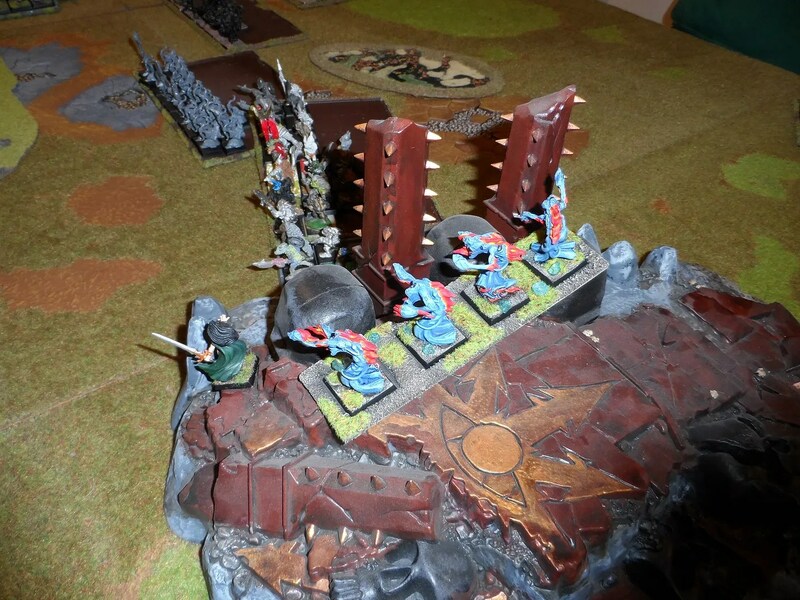 Rich and I were in fragile Alliance of Dark Elves and Tzeentch. 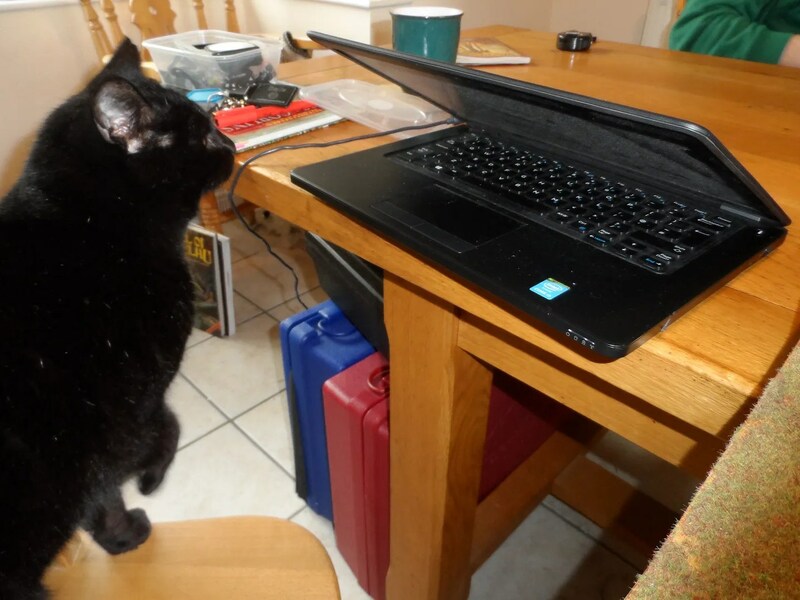 BlackJack remained by the laptop just in case ! Lots of green skins ! And it wouldn’t be a Last Hurrah without Mengil’s would it ? 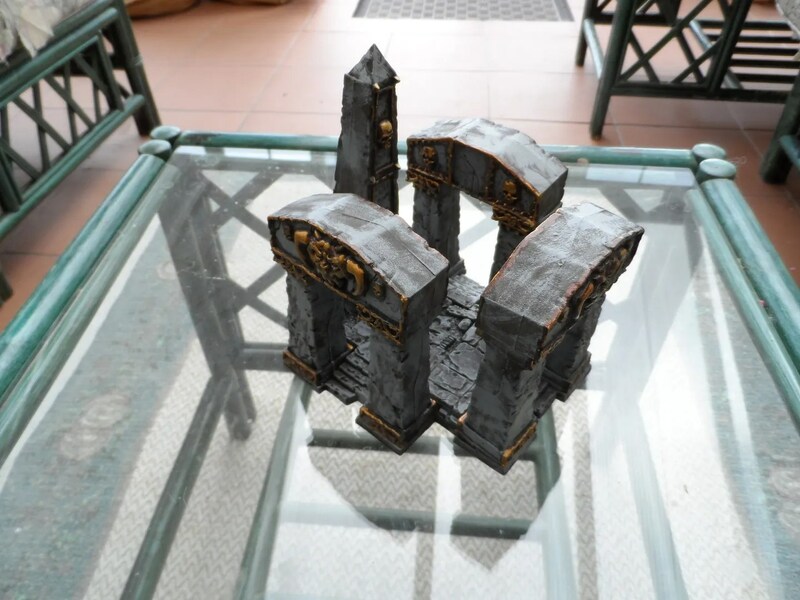 They took up position in the chaos temple. 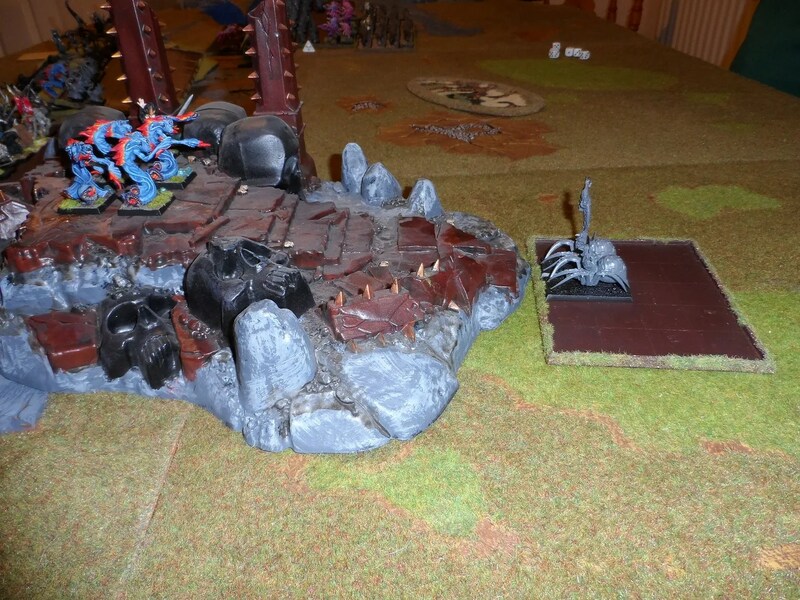 First turn initiative was won by Nav, Animosity – and what have we here: The Impetuous Spider Riders. WE decided that that would be the name of a good Punk band and spent the rest of the day imagining novel song titles. 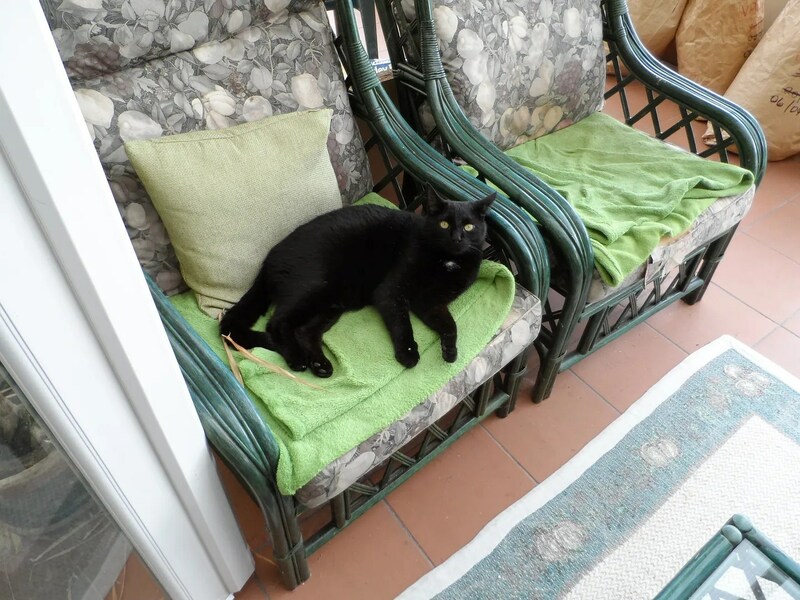 Catimosity ! 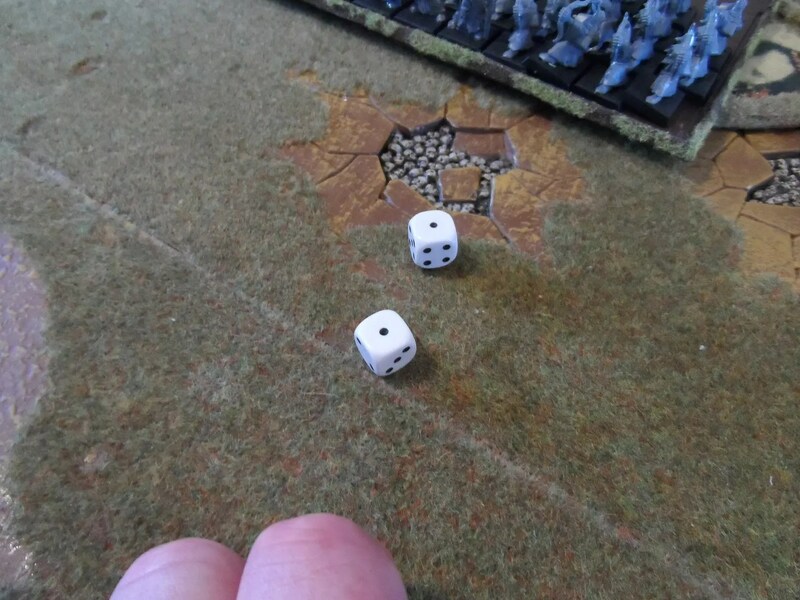 Richard fails his check, and rolls a 6, and has to stroke BlackJack. 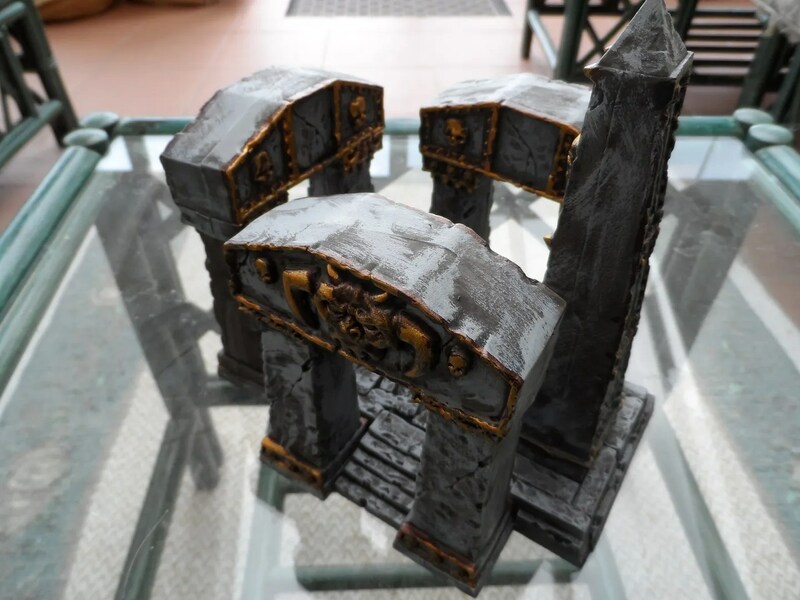 We also had a “Portal of Kittens” at the other end of the table, a running gag for the group, as the magical portal 9/10 does something fairly benign, and then on the 10th time blasts an entire unit into ashes or gives them super powers. 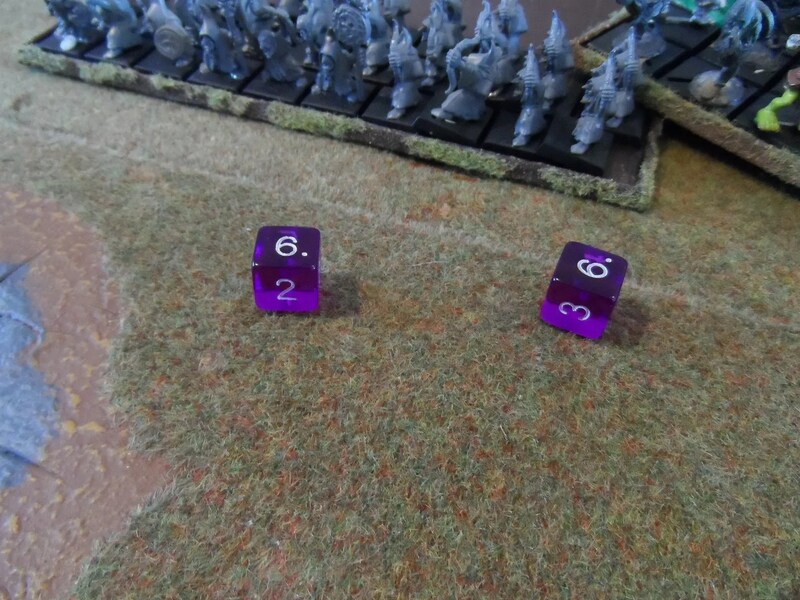 The gobbos got a minor buff spell. 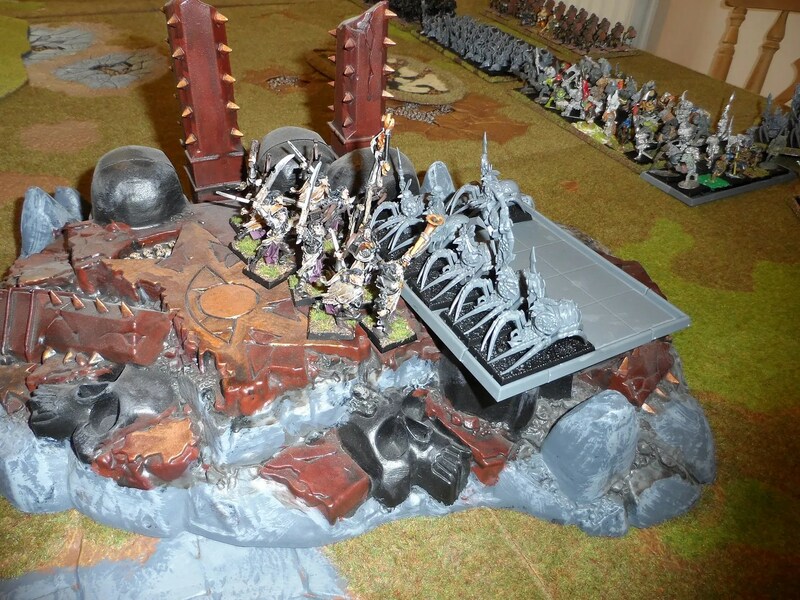 Having wiped out the Impetuous Spider Riders, Mengil’s set ready to take on the Savage Orcs. 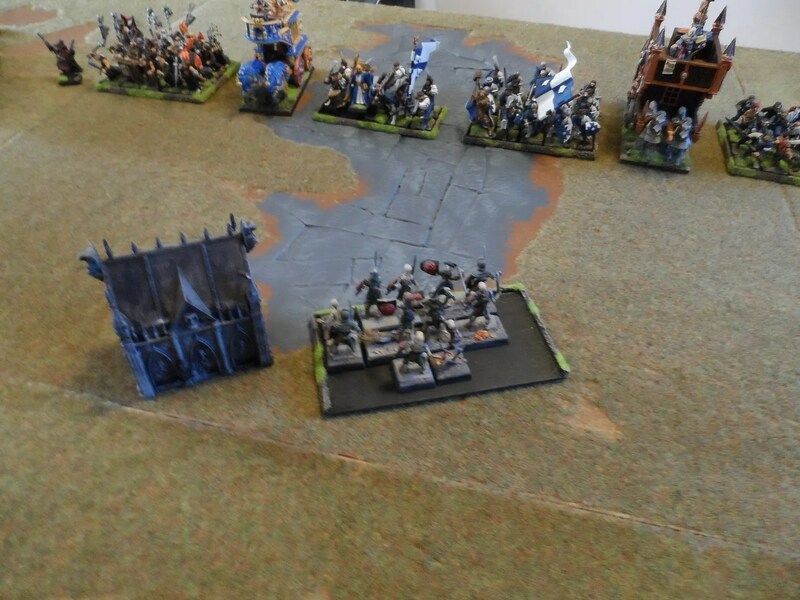 Crunch, I’d wiped out nearly but not quite half of the Savage Orcs, only to find that Nav ha plonked a Big Boss and Shaman in amongst them ! 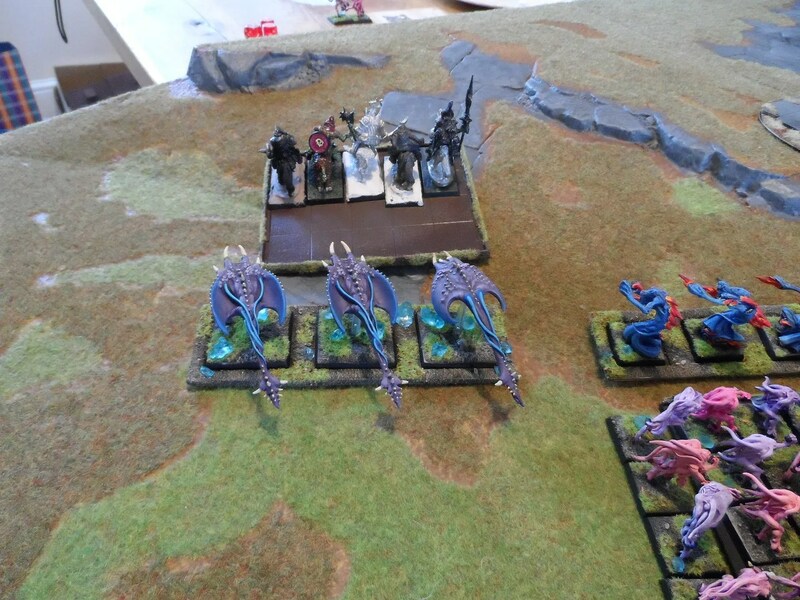 Meanwhile Nav advanced his whole army towards our very fragile looking line of RXBs and Flamers of Tzeentch. 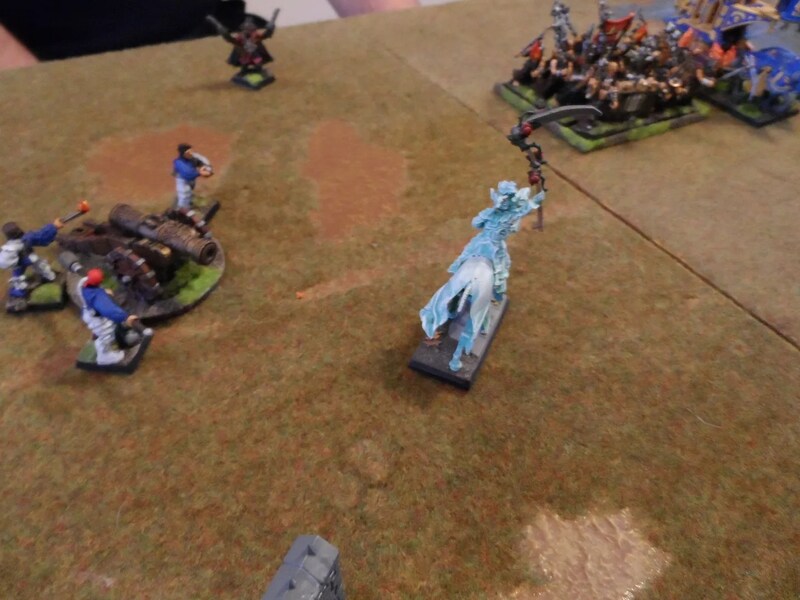 Luckily the winds of magic were not with Gav ! 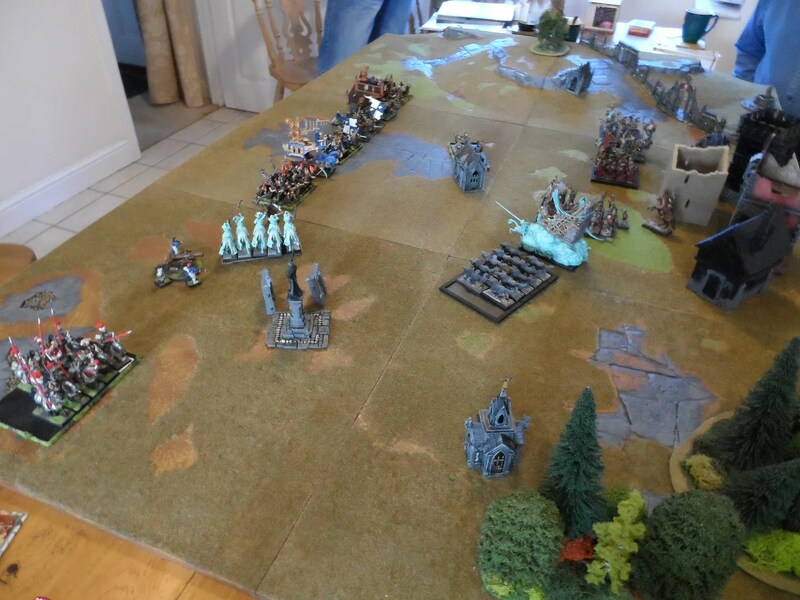 The fourth and final scenario from the Blood of Sigmar book, and our last game of the two days. I was once again, not catering in the afternoon so there’s more photos this time round. 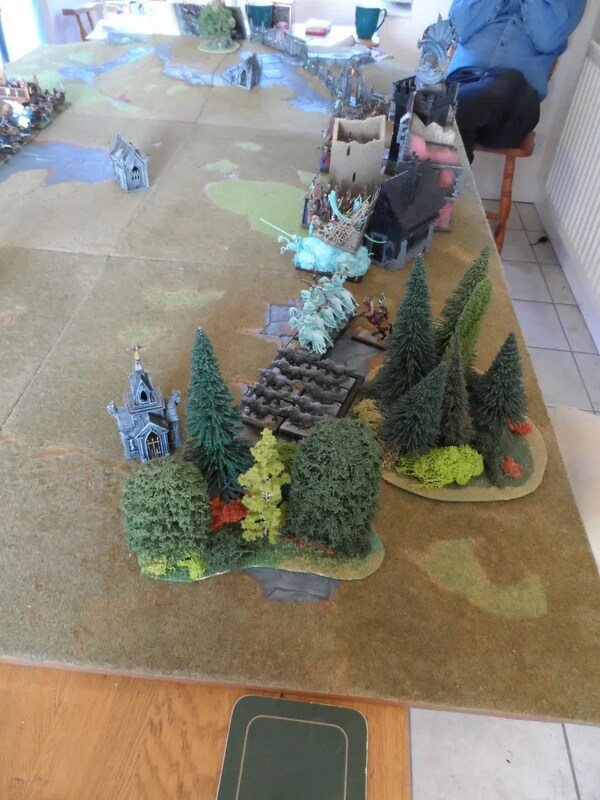 A bigger battle the the previous ones. 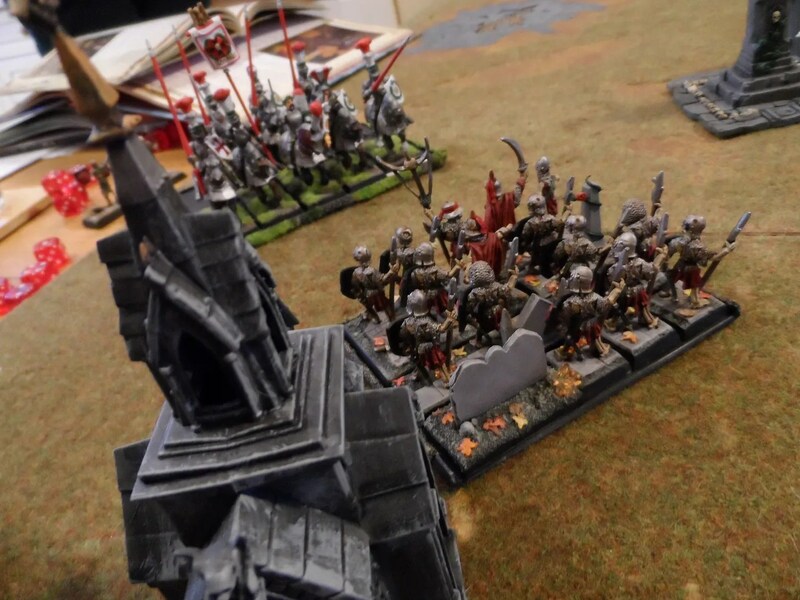 The Vampire Counts set up, but expected to receive reinforcements that would randomly emerge from the various mausoleums on the board. 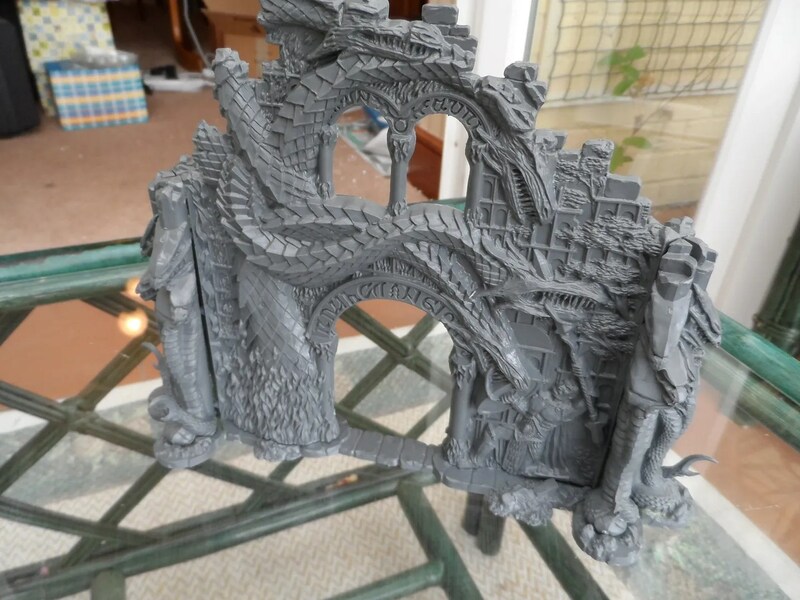 Just as well as the Empire came packing Loonarks and other weird stuff ! 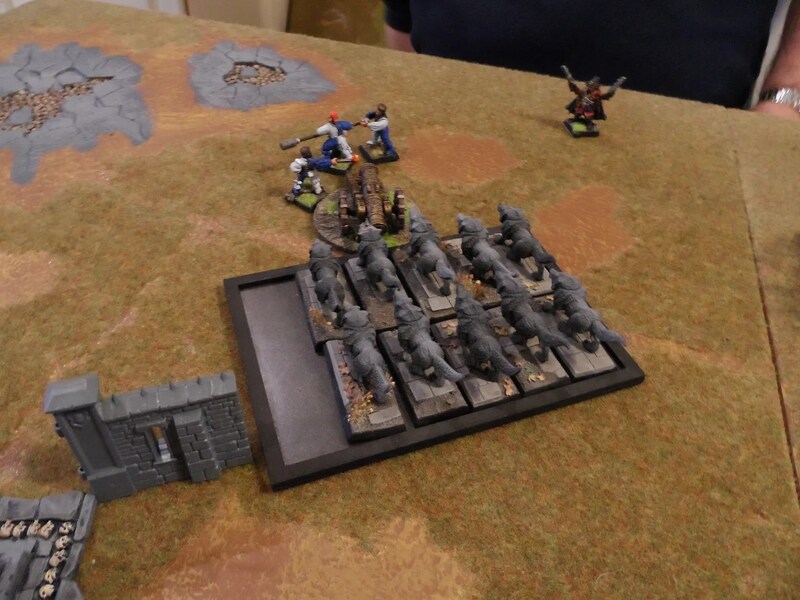 We won initiative, and cast a spell to push a bunch of skeletons across the table to get down the enemy’s gun line ASAP. 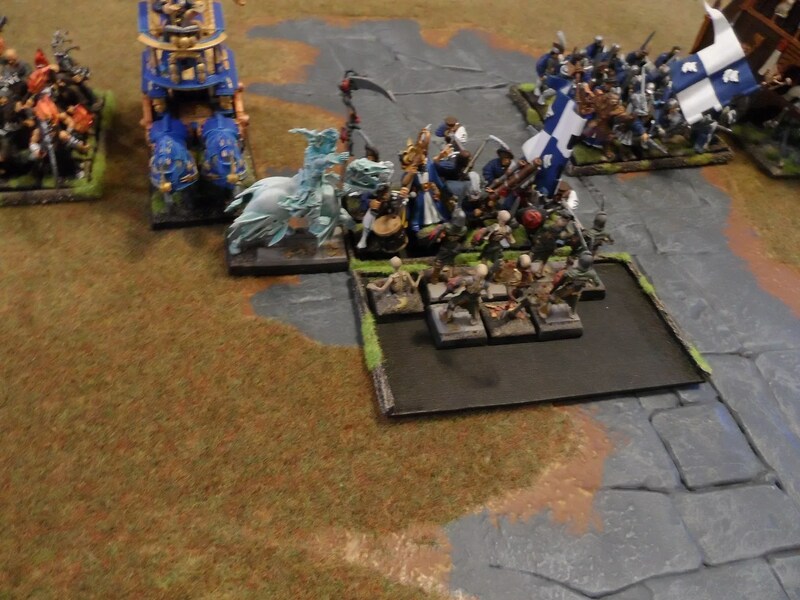 Which we followed up with more of our forces. 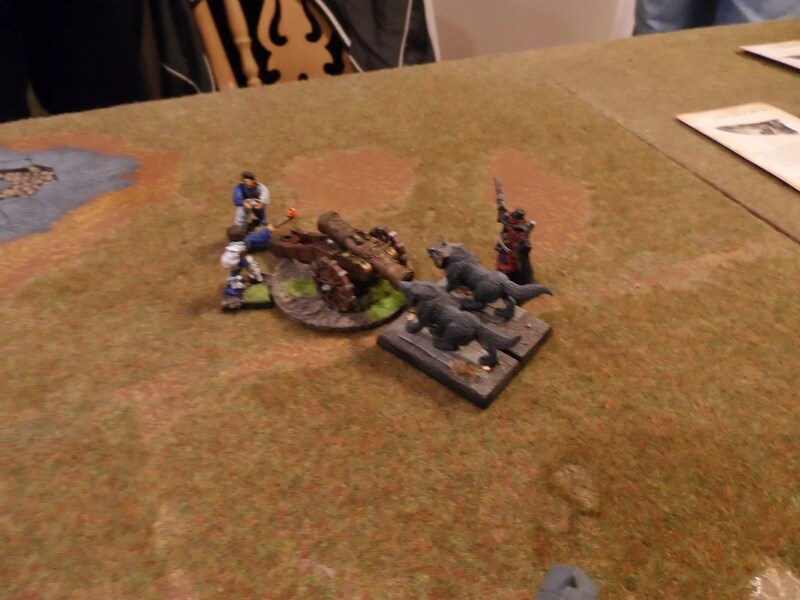 Doh, we had hoped to get into combat with the Witch Hunter again, but failed. We engaged the enemy, not with great success. Well this should be an easy win, shirley ? Don’t call be Shirley ! 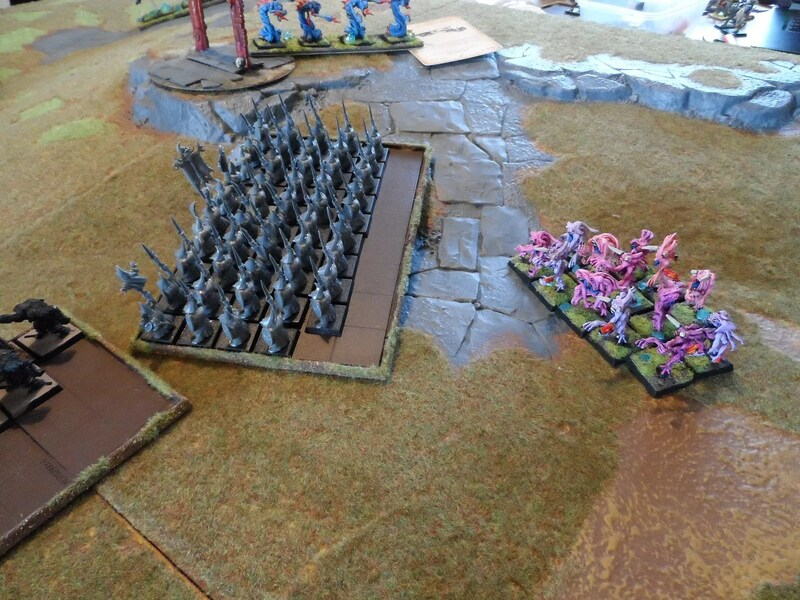 Reinforcements arrived for both sides as we clashed in a mass combat. 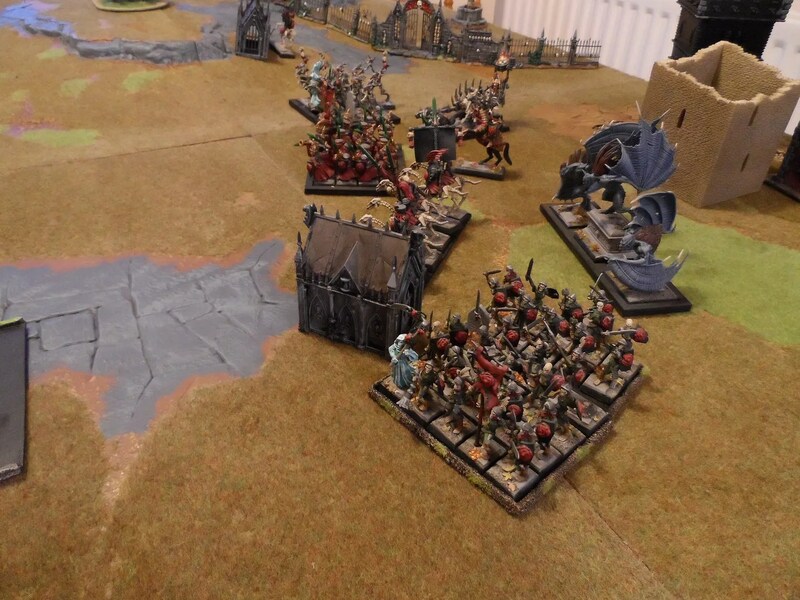 Eventually the Vampire Counts were defeated, which we suspect was the intended outcome of the campaign. Bar a few silly mistakes, the dice and scenarios were against us. 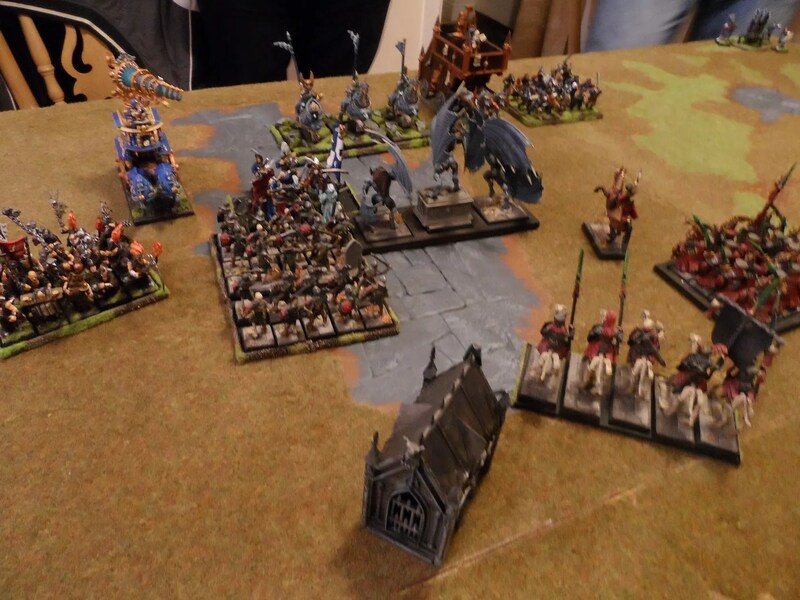 What also didn’t help was Gav and I not being au fiat with the Undead rules. C’est la vie. Important thing was we had a good time.